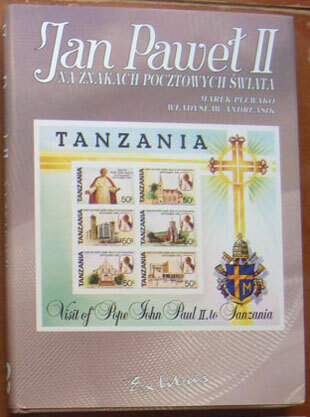 Catalog of *all* the world's stamps of Pope John Paul II 1988-1995 including postcards and covers as well as single stamps and stamp sheets. 318 page hardcover with each stamp issue pictured in full color. Full title: Jan Pawel II Na Znakach Pocztowych Swiata: tom II 1988-1995 by Marek Plewako and Wladyslaw Andreasik. An impressive and comprehensive work. U.S. shipping only, international customers please contact me for shipping rates.